If you love to sing, come along for a visit any Thursday night! If you decide you want to stay and give singing with us a go, we'll make sure you're singing the part that's most comfortable for you. Leads - mostly sing the melody, but occasionally sing harmony. If you have sung soprano or alto in other choirs, your voice may fall into the lead range. Tenors - sing a harmony part that is above the leads, similar to a descant part. They sing higher notes that add a special brightness to the music. Basses - sing the lowest harmony part and often drive the rhythm of the song. They also sing melody when it falls into the lower range. If you've ever tried to sing with a choir and been told your voice isn't high enough, this is probably the part for you! Baritones - sing a harmony part in a similar range to the leads. We often find baritones have sung alto in other choirs. No! Many members can't read music. You will be given access to audio tracks of your part so you can learn and practise at home. You'll have access to sheet music too, but even if you don't read music you can learn a lot from watching where the notes on the page go up and down. No. Vocal tuition is part of each rehearsal, and there are opportunities for individual tuition as well. 2. You need to be able to "hold your part" while others around you are singing something different. We do have an audition process of around 8 weeks, which gives you time to decide if you want to join us, and to see whether our kind of singing is right for you. Don't be put off by this -- we are a very encouraging group! And everyone in the chorus has been through this process and knows what it's like. There are weekly fees for visitors - the two weeks are free then after that we ask you to pay $5 per week until you pass an audition to become a member. 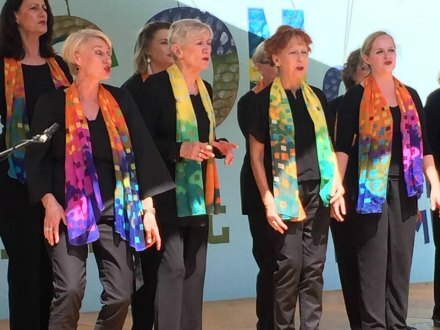 Members pay $55 per month - this money goes to paying for international coaches, venue hire, partial costume subsidy, equipment such as the risers we stand on, music, director's fees, and membership in the international Sweet Adelines organisation. Really, this is a question only you can answer. The only way you will know is by giving it a go. You might come along and find it is not for you. Or it may turn out to be one of the best decisions you've ever made! Why not give it a go? Contact us if you'd like more information or would like to let us know you'll be coming.